A full 14” tall, this beautiful basket brings to life the “days on the trail” of the pioneers. With the adjustable leather mule bridle, made in Allen County, Kentucky, carrying your favorite gear is easy and comfortable. Hang it from your wagon or put it to work for your lifestyle today. 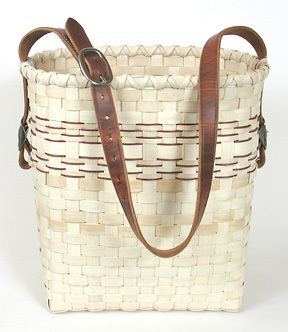 It’s a great intermediate-level project featuring shadow weave with natural and dyed reed, a filled bottom with twined perimeter, the beautiful bridle handle, and a double lashed rim. Thanks to Joanne Dunaway, friend and fellow Kentucky basket maker, and to Lynne Marrs Hammer Ferguson, Artist in Residence, Kentucky Museum at Western Kentucky University, for their inspiration in developing this pattern. 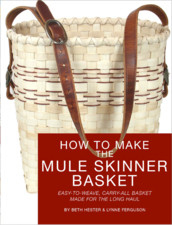 Calculate Supplies for 1 to 20 Mule Skinner baskets with the Basket Supply Calculator. The Supply List gives you the least expensive way to purchase the supplies for your quantity of baskets. View on-line or print to your printer. *This item has been rounded to 1 pound/each because it is less expensive to purchase 1 pound/each than to purchase the foot quantity. Download now and enjoy the instructions and videos. This book is available for download on your iPad with iBooks. Description: Step-by-step instruction, including video and interactive features for making a carry-all basket with techniques that apply to a wide variety of baskets.